Publicly available rental bikes in La Rochelle. Ile de Re is famous for its miles of bike paths. 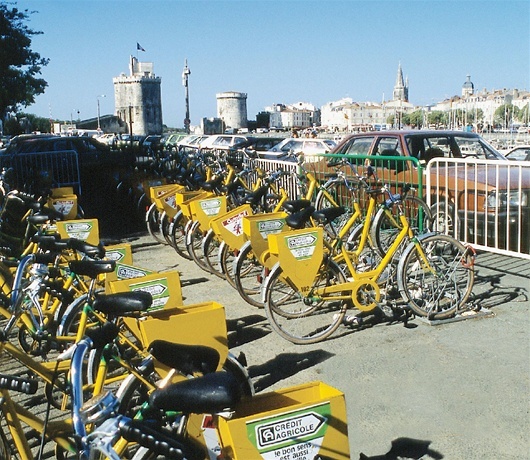 La Rochelle is said to have originated the concept of short-term rental bicycles available for public use, an idea that spread to Paris and then to many cities around the world. The French love biking – there’s a reason why the Tour de France is the best known bicycle event in the world! Bike touring in France is offered by many companies. Commonly a tour will provide an itinerary that includes overnight accommodations along the route and the bicycles if you don’t want to bring your own. Are you a fan of the Tour de France? If so, find information about the most recent race and the next one here. The Poitou-Charentes regional tourism web site has good information about biking including suggested routes and rental agencies here.